What marketing strategies will we focus on in 2014? What will we leave behind? This article takes a look at the rise of visual content - and why 2014 will be the year of visuals. I’ll give you statistics and expert opinions on how marketing online is changing, and how images and visuals are taking over. Will you be focusing on visual content in 2014? 1. 90% of information transmitted to the brain is visual. Visuals are processed 60,000X faster in the brain than text. This means any information you want to communicate is better communicated in the form of an image. It also means that, for an internet user skimming the web (or your website) you’ll be able to communicate more value, quicker. 2. Videos on landing pages increase average page conversion rates by 86%. 3. Visual content is social-media-ready and social-media-friendly. It’s easily sharable and easily palatable. Social engagement is already (thanks to the Hummingbird update to Google’s algorithm) becoming more important for your business’ SEO. Images on social media get more engagement than links or text. Images on your website have a higher chance of being shared than anything else. In 2014, visual content is just smart business. 4. Businesses who market with infographics grow in traffic an average of 12% more than those who don’t. Infographics are a visually appealing way to communicate information quickly and easily to your audience. Businesses with a graphic designer working in their marketing department can create a short infographic quickly and easily. Infographics are not only awesome for brand awareness and social-media sharing, they’re also referenced more frequently than any other pieces of content - increasing their reach exponentially. 5. Posts with visuals receive 94% more page visits and engagement than those without. People are naturally more attracted to images than they are links or text. 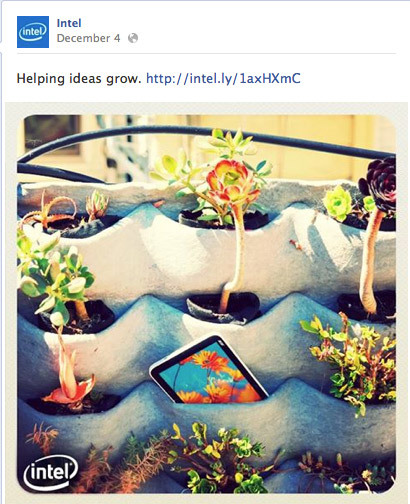 Facebook posts with an image receive, on average, more than twice as many comments as those without. Photo albums on Facebook receive 180% more engagement than a normal post. 6. 60% of consumers are more likely to click on a business whose images appear in search results. Basically this means you need to find a way to show your products with an image. For SaaS or B2B companies, this may be an icon or your logo. Try alt tagging these images with your product name, so when somebody types ‘A/B Testing tool’ your image pops up above your competitors. Surprised by that statistic? It’s not the only one I’ve got. In my article The Psychology Behind a Successful Facebook Ad Part 2: Images I cite a study from 2003 in which a Harvard student worked with a South African bank, sending 50,000 letters offering short term loans. They varied the interest rate as well as included psychologically-influential cues. It turned out that having a wholesome, happy female picture in a corner of the letter had as much positive impact on the response rate as dropping the interest rate by four percentage points. 8. Visuals show your products without telling people about them. This allows viewers to make their own decisions without feeling pressure from your business. One of the chief complaints by online users is the constant badgering they receive from brands. Advertisements dog their mobile apps, social networks, searches, etc. Any way you can promote your business without spamming your audience should be pursued and invested in in 2014. Inspirational without being pushy. Visually appealing without being over-the-top. Understated. It promotes their brand without pushing it down the throat of their audience. Take a note. 9. Visuals express ideas quickly - in a snapshot. This breaks through the overwhelming clutter of online content. Easily-palatable content is the future of content marketing. The internet user wants as much valuable information as possible in as short as time as possible. Infographics, Slideshares, Facebook posts - these are the pieces of content that will be establishing your business as a trusted resource in your field in 2014. I, for instance, created the header image and Slideshare for this article. With a little bit of time and energy any marketing manager can learn enough to put together something more appealing than straight text. Start slow and see what engagement increases you get. Or employ a freelance designer to do some visuals for an A/B test on your website - just to see what you find. 2014 will see a rise in visual content, and a decrease in the reign of info-heavy, fact-heavy blog articles. Photo editing tools are easier to use, and people are slowly but surely noticing how much brand engagement they stand to receive if they can communicate with images rather than words (or both). Have you tested visual content vs written content for your brand? Have you started to recycle your blog articles into visually appealing infographics or Slideshares? Start the conversation below!